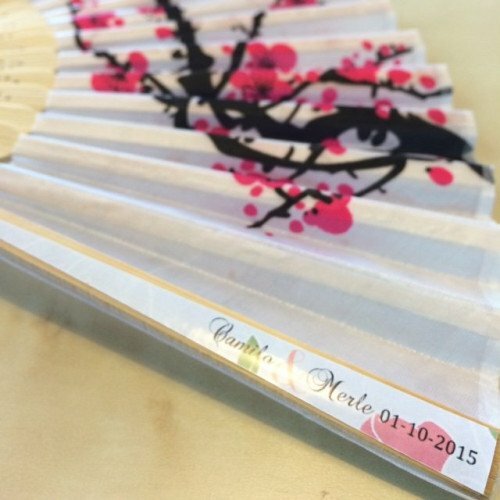 Your guests are sure to be big fans of these delicate cherry blossom design silk folding fan favors. Brilliantly displaying a cherry blossom branch - a traditional symbol of true love – these fan favors are simply sensational. A pretty and useful choice as beach themed favors, destination wedding favors or for any summer event. 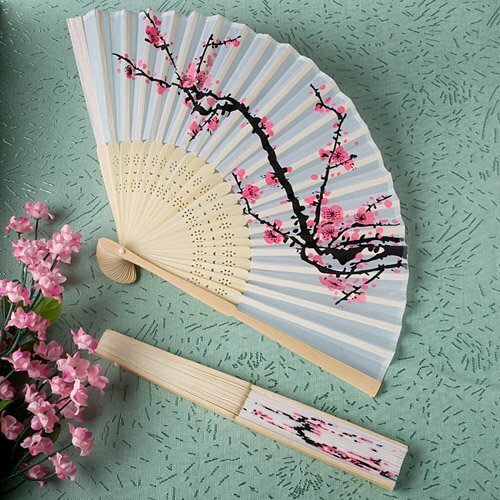 Each 8 ¼” silk and wood folding fan has an intricately carved light wood collapsible ribbing structure and an attached outstretched white silk fan with a traditional pink and black cherry blossom branch design. Personalize them with a matching floral sticker along the rib. Personalization is available for a minimum of 50 fans purchased. - Your items will be personalized with text exactly as you present to us. - Items personalized as per order cannot be returned. Carefully double check spelling and capitalization. - 1 week production time, please allow further preparation time for orders above 100 fans.